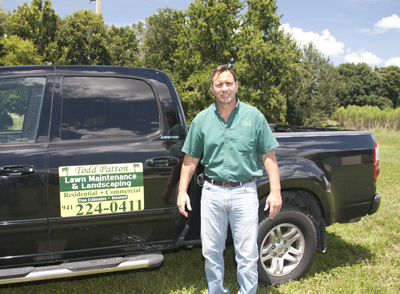 Todd Patton started his Lawn Maintenance & Landscaping company in 1998. From the very beginning Todd's vision for the company was to not only offer superior and personalized service, but to focus on the aesthetic aspects of landscaping. Anyone can mow a lawn, but it takes a dedicated and creative personality to enhance the exterior beauty of a home. Todd enjoys working on the landscaping for homes in Lakewood Ranch and the immediate surrounding areas of Sarasota and Bradenton. No home or property is too large or too small. Todd has the crew, the experience, and the equipment to handle any sized job. Todd Patton also proudly served in the US military. His attention to detail, and desire for perfection has become the trademark of his company and is setting the standard for other local Landscaping companies. Clients have found that Todd and his employees are punctual, respectful, and exceed their expectations constantly. Todd Patton Lawn Maintenance & Landscaping goes above and beyond, and adds those little extra touches that other landscaping companies don't think about. Over a period of time Todd's company will not only maintain your landscaping, but they will take an already beautiful lawn and mold it into something that is truly stunning. Todd has always had a love for the Florida outdoors. After spending many years wearing a suit and working in a stuffy office, one day Todd decided to change his career and set out on his own. Starting a landscaping company seemed like the perfect idea, and he has never regretted his decision. Todd enjoys being in the fresh air, helping to enhance the appearance of homes and excelling in landscaping. Todd is grateful for the opportunity to interact with great home and business owners who appreciate his fine work. He is proud that most of his growth has come from word-of-mouth referrals given by satisfied customers. If you live in the Lakewood Ranch area and are looking for a company to handle your landscaping needs, please call Todd Patton Lawn Maintenance & Landscaping at 941-224-0411.